Let everyone know YOU'RE a Red Raider with this awesome license plate! Shiny red accents reflect at night to show your Tech pride! 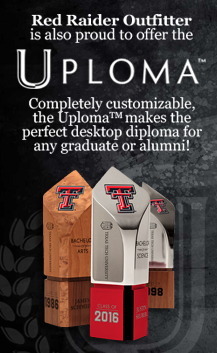 Great gift for any Red Raider grad! Wine decanter, wine stopper and 2 wine glasses Features pewter Double T emblem on each Chest measures approximately 15" x 12" x 7.5"
Great Double T and Texas Tech detail! Perfect for any Tech fan! Makes a great gift! Elegant brushed metal frame with highly polished inner border Laser etched Double T and Texas Tech in black Holds a 5" x 7" photo Measures approximately 6.125" x 8"
Chrome and matte black finish Adhesive back Looks great when coupled with a Double T car emblem! Measures approximately 3" x 1"
Adheres to any glass, metal or plastic surface Weather and fade resistant Made in the USA Approx. 7.75" x 4"
Texas Tech Alumni in white print Easy to apply For outdoor use Measures approximately 8" x 2"
Texas Tech ALUMNI with Double T Easy to apply For use outdoors Measures approximately 6.5" x 2"